and a digital file available to research in the Museum. (click the photo-link above for details of St Peter's at Wawne). The terms in CAPITALS refer to illustrations and diagrams in the original leaflet, which is still available from the Church Exhibition in the Old School, open every Friday, admission free. A Chapel at Sudtone (Sutton) was first mentioned c.1160, occupying the site of the present church. It was built on the relatively high ridge of land stretching from Waghen (Wawne) towards Bilton, and was surrounded by low-lying marshy ground. It was separated from the mother church of Waghen in 1247. After this, Sutton had its own priests, usually relatives of the Lords of the manor, though Wawne retained rights of burial until much later. By 1346, the chapel being in a dilapidated condition, the Lord of the manor, Sir John de Sutton, junior, decided to found a college of priests at Sutton, and agreed with his uncle, Thomas Sampson, rector, that the rebuilding should be undertaken at once. The result is the building we see today, though much altered inside. Sir John was responsible for the expense of building the nave, using bricks, the manufacture of which had recently been introduced; and the chancel was remodelled or rebuilt by Thomas Sampson (or his college of priests), the stone being brought upriver to Stoneferry and thence by the Antholme Dyke to Sutton. The new church was dedicated on 12 September 1349. Already in place in the chancel, some eight years before his death, was the fine stone TOMB of the founder, Sir John de Sutton, depicted clad in the armour he wore in 1346 at the Battle of Crècy. 1349 was a year of national significance, remembered for that great pestilence, the Black Death. Out of 50 monks at Meaux, only 10 survived, and the population generally, much diminished. As we stand at the West end, we see the nave and chancel built in the Decorated style, the nave for the use of the villagers, and the unusually long chancel where the priests of the college said their daily services. The west end, including the brick Tower, was built later, probably at the beginning of the 15th century, in Perpendicular style. The nave aisles were extended to embrace the tower. Note the west DOOR and WINDOW, and, too, the massive, diagonally-placed PIERS, all typical of the period. The FONT, set on a modern base, dates from about 1200, and probably stood in the old chapel. The nailhead ornamentation round the rim characterises the Early English period. The font was moved here to form the small baptistery in 1922, the area formerly being used as a side chapel. Possibly the PISCINA (drain for washing the sacred vessels) in the south-east corner of the nave also dates from this time. The position of this piscina, and the nearby niche, indicates that formerly an altar would have stood here; and also in the corresponding place in the north-east corner, where an aumbrey can be seen. The carved oak SCREEN between the tower and the font is a beautiful fragment dating from about 1450, and is probably part of the rood screen which originally separated the Nave and Chancel. Note the Perpendicular tracery, and see how one bay, possibly forming part of the door, differs from the other four. After the Reformation, along with the dissolution of the monasteries, came the suppression of the religious communities, and the College of St James was dissolved about 1547. The priests were pensioned off and the property of the church was seized by the Crown. Soon afterwards, parish registers were kept, at first in Latin, later in English. For the next 300 years, Sutton church gradually decayed and was repaired or patched up. The height of the chancel was cut down, destroying the chancel arch and the tracery and pointed arch of the east window, now of five lights, but originally seven. The pitch of the nave roof was lowered and its external walls covered with rough cast. Some windows lost their tracery and were blocked. In 1785 the first of the galleries was erected, positioned between the arches of the nave and the side walls, which were pierced for the placement of windows, forming a kind of clerestory. Seat stalls had replaced the open benches, and at that time a singing loft was situated at the west end. Beneath was an organ, worked by a handle. A fine three-decker pulpit stood between the nave and chancel, on a level with the galleries, with the reading-desk and clerk's desk below. The PAINTING of St James the Great by Parkin, was fixed to the front panel. The church interior was very different from that of today. The Victorians set about restoring the church in July 1866, when the building was closed for worship for a year. A brass plate in the vestry records the architect as R G Smith, the Borough Surveyor, though the Plans in the County archives show the architect as Cuthbert Brodrick. The galleries were removed, and the chancel arch and floor raised. Next to the new SEDILIA, but much lower, remains the medieval PISCINA. The east and west windows were reconstructed. Stone PIERS in the nave replaced the imposing brick columns. The whole church was reseated and open pews installed. A new VESTRY was built to replace the one in the south-west corner. The WALL MONUMENTS in this corner are interesting, the virtues of those commemorated being much cherished; the Bell family was prominent in Sutton for several decades. Another interesting tablet, in the baptistry, is that of Charles Pool, who was the King's commissioner for drainage in this low-lying parish. The new PULPIT of marble and stone was acquired. The ROOFS were remodelled and raised. At the same time, the PARSONAGE HOUSE was built in Wawne Road, designed by Sutton architect and historian, Thomas Blashill. Shortly after the major restoration, gas lighting was installed, and in 1870 the monument of the founder was moved from the centre of the chancel to the side. In 1873 the present ORGAN by Forster & Andrews was built, though the organ chamber itself was not completed for another ten years. Its presence gives a somewhat curious appearance in that the Decorated windows now look into the organ chamber and vestry, instead of onto the churchyard. In 1889 a great deal of exterior work was carried out, including the buttresses. The south side was provided with new battlements and pinnacles, whilst the north wall was completely taken down and the windows of the galleries removed. A new doorway was constructed. The name of LIDDELL will be noted - inhabitants of Sutton House for almost a century, and great benefactors of the church. To them we owe the handsome brass LECTERN, the stained glass of the east and west windows, the re-casting of three bells, and a further three bells. Of the windows, that of the three saints in the north-east of the nave is probably the finest. The glass was a product of the firm of C E Kempe, depicting in the lower left corner a small wheatsheaf, the symbol of the glazier. The central light shows the patron saint of the church, St James the Great, wearing his pilgrim's hat with its cockle shell, and carrying his pilgrim's wallet and staff. The window was set up in 1906 in memory of Thomas Kirk, who lived at 1 Church Mount. His family owned Kirk's Farm, on the site of Kirk Close, and were connected with the Kirk Collection at York. In 1920, the widow of Thomas Margison gave as a memorial the new CHOIR STALLS and READING DESK, and funds for the sanctuary walls to be panelled. The frontal carvings of the altar were executed at about the same time by the vicar, Revd George Arthur Coleman. A further commemoration was made by the Scott family of The Hollies in 1933 when the church was provided with electric lighting. It was not until 1955 that the rough-casting placed on the nave walls in 1793 was removed, exposing once again the medieval brickwork on the south side, now 650 years old. A decade later, it was deemed necessary to rebuild the battlements on that side. In 1968 the vestry was refurbished in oak by 'Mousie' Thompson, as a memorial to Emily Calvert by her husband, Con, whose family were Sutton blacksmiths for a century and a half. The 19th century porch over the south door was removed in 1972, being by then in a poor state of repair. 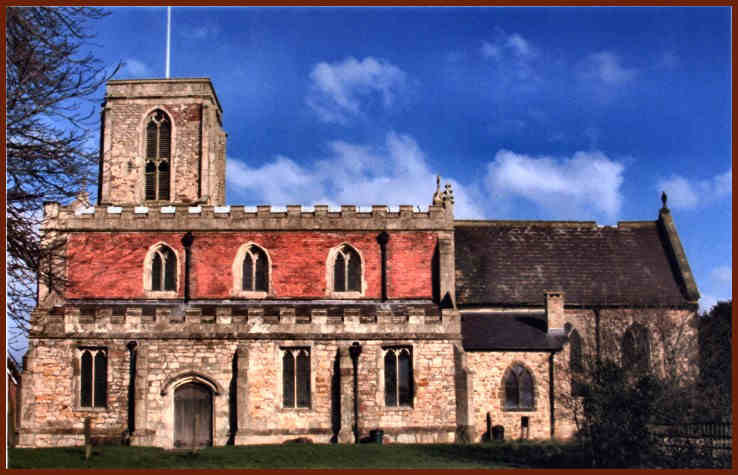 St James' Church has been the centre of worship in Sutton and Bransholme since medieval times, and we hope you will enjoy your visit to this beautiful church. local history of the area. Sadly, this book is now 'out-of-print', including the second edition that was reprinted in 2006.
click the button in the side menu. that pre-dates the City of Hull by several hundred years. generally available at the above locations. where Rob will do his best to help you. Many Hull folks are not aware that, until 1887, the parish of Sutton and it's church of St James', extended so far south, way past Stoneferry shown here, until it almost reached the Humber itself. Only the smaller parish of St Peter's at Drypool was then in between, for perhaps less than a thousand yards, when Sutton stopped short at Witham, with the boundary returning northwards up Dansom Lane. St James' only lost this extended southern finger of its area when new parishes were formed form the increasing populations that moved into the newly built terraced streets and avenues on either side of Cleveland Street. The new church of St Mark's was consecrated in 1887, so the 1881 Census of six years previously was the last one to list this area as being part of Sutton. This stylised background map is of the area to the south-west of Sutton, depicting those heavily industrialised areas of Stoneferry and Wilmington, as they had become by 1928. It was this industrialisation that built up the river bank by degrees, with wharves and jetties, thus controling the course of the River Hull in a way that it had never been controlled before. Historically, the surrounding land was always very wet, on both sides but particularly the eastern bank, and maintained that way by a river that burst its banks most winters, and so only fit for grazing cattle in summertime. Hence we get the Viking name, 'Summergangs' - the land where cattle went to graze in summer. Much of that particular area is where Garden Village was built, on the right hand side of this map. The Foredyke Stream makes a bee-line down the centre of the map, to eventually drain it's water into the Hull right by today's North Bridge. The lane from Sutton, for folks needing to get into Hull - the town being on the other bank of course - came down to Stoneferry Green, and thence Stoneferry Road and onto its continuation, today's Cleveland Street shown dusty brown on this map. In summer, the journey could be bad enough, but in winter, frequently impossible. The coming of the railway to Sutton, from the 1860s onwards, gave those folk almost instant access to Hull without so much as getting their feet wet, and the railway's very existance possibly delayed for some time longer any chance of improvement of the road itself. The late 1880s saw the rails for the first horse-drawn trams routes being laid, and one such route was laid to Stoneferry, terminating at The Green. This in itself caused much improvement to the road for pedestrians as well as carts, and although it was never upgraded when electric trams made their appearance on other routes, it did improve vehicular journeys to and from Sutton considerably. Early horse-drawn omnibuses of the Edwardian era completed the route up Leads Road to Sutton, and improvement in petrol-engined bus design after the First War would make a direct bus route connection permanent. Hopefully, this explanation may go some way to answering the many questions we get, often from overseas, to the puzzle as to why residents of Lime Street, Cleveland Street and The Groves area are listed as being in Sutton Parish right up until the 1881 Census. It is also worth pointing out that, before Cleveland Street itself was improved, with the 'New' bit, the ancient way to Sutton followed the river bank to start with, by way of Lime Street. The relatively new St Mark's Church - only 54 years old - was badly damaged during the Blitz, and finally demolished in 1957, with the other churches suffering the same fate through falling attendances as the densley-built Victorian areas were cleared and industry increased its hold on the area. That is why the War Memorial plaques from those churches were then deposited at our War Memorial in Sutton, and so we in the museum are more than happy to take enquiries about any of the military personnel who lived in those areas and came under those former parishes. The grandparents of those men were technically Sutton folk, so in a sense, the legacy of their history has come home. This background map was made just for desktop use, with a bit of added artistic license and derived from www.old-maps.co.uk, and so not to be taken seriously for research. The originals can be viewed online for free at www.old-maps.co.uk. There is also a map and small diagram, explaining the close proximity of the Sutton and Wawne villages and the growth of Bransholme in between, as well as our historic connection to Stoneferry, Wilmington and The Groves, further down the Home Page.